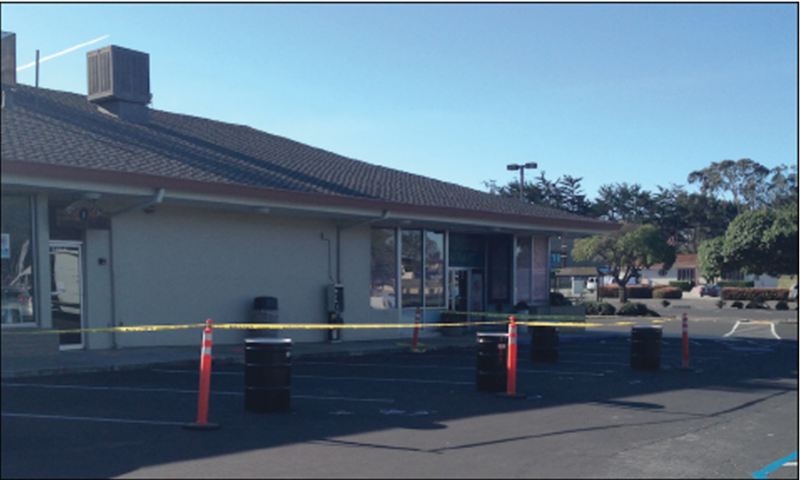 The site of a former dry cleaner was chosen for a PlumeStop® performance evaluation to treat chlorinated solvent groundwater contamination. PlumeStop was applied in conjunction with the slow-release electron donor, Hydrogen Release Compound (HRC®) and the microbial bioaugmentation dechlorinator inoculum, BioDechlor INOCULUM Plus (BDI® Plus) for the treatment of residual PCE (550 μg/L). The application was conducted around a single well. Conditions prior to the test were aerobic (ORP +254 mV; DO 4.4 mg/L). Multiple parameters were monitored from groundwater samples to explore lines or evidence of solvent fate/degradation. Post-treatment solvent concentrations in groundwater were reduced by over 99% to non-detect (<5μg/L) within the first nineteen days. 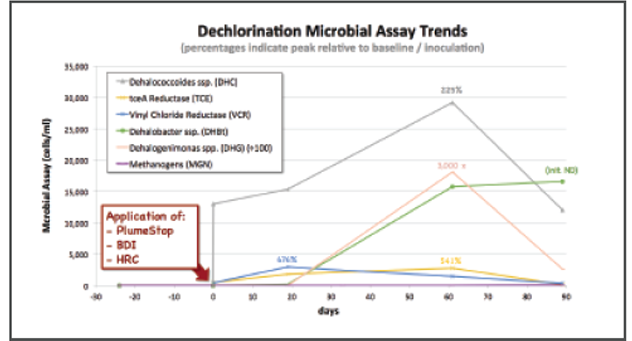 Microbial quantitative array data revealed marked increases in reductive dechlorinator species from baseline conditions in the months following reagent application. Baseline was measured as immediately post-inoculation for species included in BioDechlor INOCULUM Plus (BDI® Plus). In addition, functional enzymes for dechlorination of PCE through to ethene similarly increased over the same period, including specific genes for the degradation of TCE, DCE and vinyl chloride. 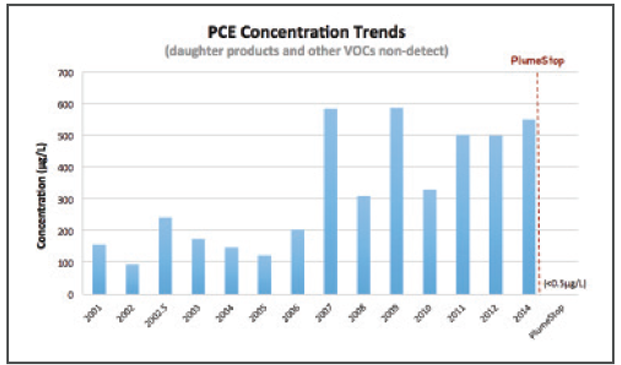 Throughout, groundwater concentrations of PCE and daughter products remained below detection limits. Electron donor status and redox potential post-application quickly stabilized at near-optimal conditions ( 150mV +/- 30 mV), with rapid decreases in competing electron acceptors observed within the first sampling intervals. The redox remained below methanogen activity thresholds – methanogen numbers did not share the trends observed in dehalorespirers at significantly lower cell counts than Dehalococcoides (94 vs. 12,200 cells/ml). The continued expansion and proliferation of an active dechlorinating microflora in the months following inoculation are indicative of continued solvent biodegradation. The fact that no solvent was present above detection limits in groundwater through the same period would indicate the degradation to be proceeding ostensibly from the sorbed-phase (i.e. PlumeStop/water interface). This is consistent with the PlumeStop bio-matrix hypothesis. It is important to note the dechlorinator numbers and activity peaked at approximately sixty days and declined thereafter. Although the data set is limited, this trend would be consistent with the presumed depletion of the solvent through degradation, the starting concentration having been only 550 μg/L. Data provide lines of evidence for post-sorption degradation of the target solvents on the PlumeStop, and would further indicate that methanogenic conditions are not necessary for complete reductive dechlorination activity through to ethene. Moreover, all data were obtainable from groundwater samples presenting a straightforward means of performance tracking via wells using the lines of evidence approach. 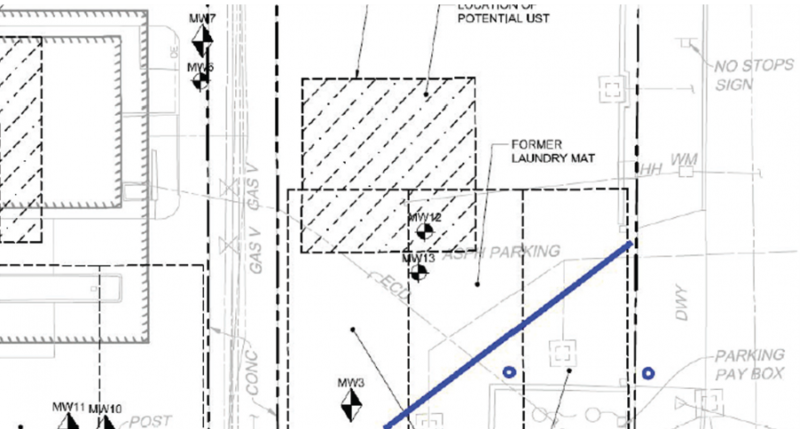 Results of the evaluation at this site are consistent with those of other sites exhibiting similar levels of contamination addressed by PlumeStop and combined bioremediation approaches.